So, just how do you attack this Broncos defense? It's a question that most teams have failed to answer over the past three years, including your own New England Patriots. The Pats got two shots at Denver last year and lost both times, noticeably struggling to deal with the Broncos lethal combination of pass rush and tight man coverage. Denver's defense isn't quite the historically good unit that carried them to a championship last year, but they remain one of the league's most dominant units. Von Miller continues to wreak havok on any offensive tackle unfortunate enough to cross his path, joining future Hall of Famer Demarcus Ware and talented up-and-comers Shane Ray and Shaq Barrett to form the league's deepest rotation of edge rushers. That puts an onus on opposing pass catchers to get open quickly, which is easier said than done against the smothering man coverage of Aqib Talib, Chris Harris Jr and Bradley Roby. As a result, opponents have thrown more interceptions (12) than touchdowns (10) against this year's Broncos, while averaging a league low 4.9 net yards per pass attempt. Despite that catch 22, there are vulnerabilities to Denver's imposing defense that the 2016 Patriots are more than capable of attacking. Specifically, a look back at Denver's Week 5 23-16 loss to the Falcons might provide a blueprint the Pats could replicate this week. Man coverage is tough to beat against a team with such good corners but, like any coverage scheme, there are weaknesses to it that can be exploited. 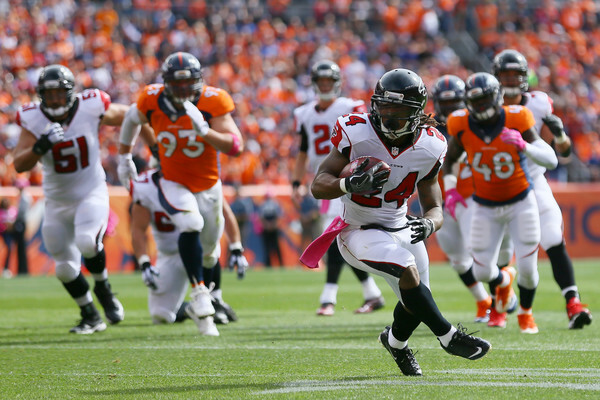 The Falcons did so by utilizing their talented and versatile running back duo of Devonta Freeman and Tevin Coleman, motioning them outside and then taking advantage of their quickness advantage against the Broncos linebackers in coverage. The Falcons first attacked that particular mismatch on their fourth offensive snap of the game. On first down, Coleman starts the play in the backfield before motioning out to the slot. Linebacker Todd Davis (51) matches his motion, a strong indicator that man coverage is coming. 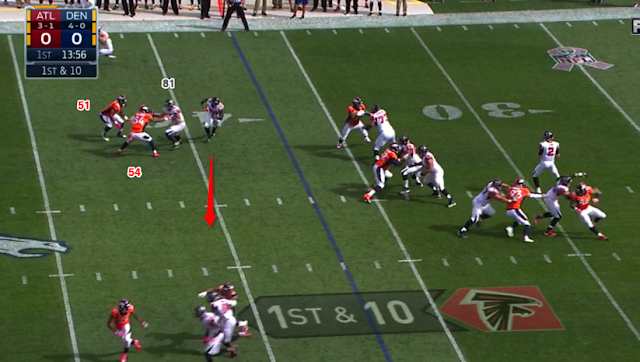 With a clear on-paper mismatch visible, the Falcons attack. Tight end Austin Hooper (81), lined up in-line on Coleman's side of the formation, pushes his route vertical, with Coleman making a sharp in-cut underneath his route into the middle of the field. Essentially Hooper sets a semi-legal pick on Davis, who is unable to get around Hooper and his defender (linebacker Brandon Marshall, 54) due to the cushion he's giving up to Coleman at the snap. As you can see, there's nothing but space in the middle of the field Coleman to attack. Matt Ryan hits him in stride and the speedy back does the rest, breaking a tackle on his way to a 48 yard gain. Atlanta would get into the end zone five plays later, setting the tempo on a day that their offense would help snap Denver's nine game winning streak. That cushion given up by Davis is less than ideal, but necessary given the speed mismatch he faces on the play. The Patriots took advantage of similar situation during their Monday Night win over Baltimore. 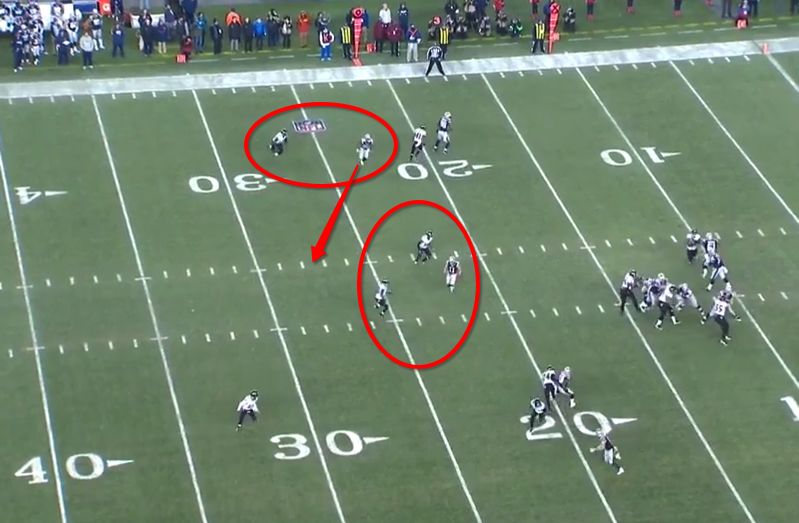 Facing a 3rd & 4 early in the second quarter, the Patriots motioned James White out of the backfield to split all the way outside. Linebacker CJ Mosley followed the motion, giving Brady a clear indication of man coverage (a corner would generally remain split wide if it was a zone coverage). Like the aforementioned Davis, Mosley is giving a major cushion in respect to White's speed advantage. As a result (with an assist to Julian Edelman drawing safety attention away from the middle of the field), White had plenty of space inside, allowing Brady to get an easy completion on the slant. Like Coleman, White was able to take advantage of his athletic advantage in space, simply outrunning the mismatched Mosley after the catch en route to a 61 yard gain. For further example on why such cushion is necessary for a linebacker stuck in a man coverage mismatch, we turn back to the Atlanta-Denver film. 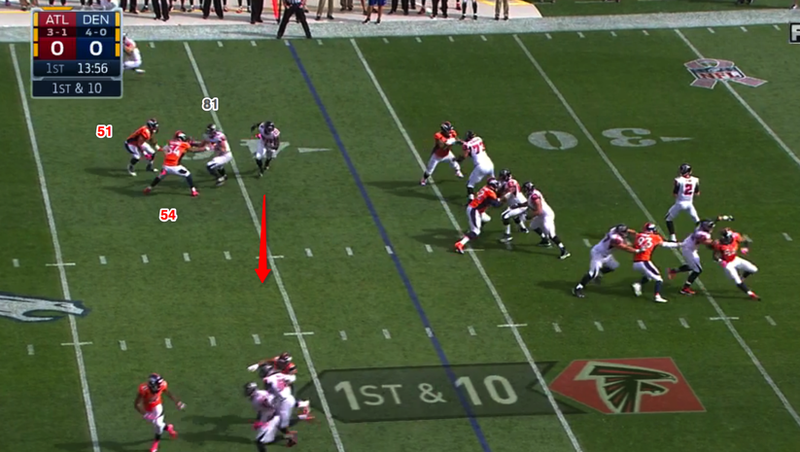 Backed up into a less-than-ideal 2nd & 19 situation, the Falcons once again motion Coleman into the slot. This time he draws Brandon Marshall, Denver's best coverage linebacker and one of the better coverage linebackers in the league. It doesn't matter, as Coleman runs right by him on a vertical route for a 31 yard touchdown, establishing a 20-3 lead that Atlanta would not surrender. Backs against backers in the passing game was a mismatch Atlanta attacked time after time in key situations. They followed up Coleman's big first quarter play immediately by motioning Freeman out to the slot, where he spun Marshall around with a Edelman-esque route to set up a first and goal. With five minutes remaining in the second quarter and facing a 3rd-and-5, they dialed up a wheel route to Freeman, who drew a pass interference call against reserve linebacker Corey Nelson. That extended a drive that would result in Atlanta tacking on a field goal to their lead before the half. Atlanta would once again go back to the well in the fourth quarter. A Mohammed Sanu fumble had allowed Denver to get a field goal at the start of the fourth, allowing the possibility of a Denver comeback to creep into the minds of many. Ryan and the Falcons quickly squashed that possibility by going back to what had worked all game. This time, Coleman was motioned into the slot and ran right by Davis, making an over the shoulder catch for a 49 yard gain to set up an answering field goal for Atlanta. Few teams have any back that can replicate the passing game skills Freeman and Coleman bring to the table, let alone two of them. The Patriots are fortunate enough to be one of the few, with both James White and Dion Lewis becoming bigger parts of the game plan in the absence of Rob Gronkowski. White and Lewis are two of league's best receiving backs, with each a considerable mismatch against nearly any linebacker who attempts to cover them one-on-one. Combine that with the steady staple of bunch formations and rub-routes the Patriots use (both being classic man coverage beaters due to effects like the Hooper/Coleman pick play highlighted earlier), and the Patriots are uniquely equipped to utilize aspects of Atlanta's successful strategy. Finding man coverage mismatches against Denver's linebackers was an effective strategy back in Week 5, when Denver had both of it's starting linebackers healthy. It might be an even more vulnerable spot in Denver's defense now, as both Marshall and Davis are currently battling injuries. Marshall hasn't practiced since suffering a hamstring injury back in Week 13, while Davis injured his ribcage in this Sunday's loss to Tennessee. If Davis can't go (he was working off to the side with a strength and conditioning coach during Thursday's practice), Denver will trot out the unimposing duo of Corey Nelson and Zaire Anderson, who came into the Tennessee game when Davis went down. Nelson was a 2014 seventh round pick, while Anderson joined the team in 2015 as an undrafted free agent. At 6'1" and 226 pounds (Nelson) and 5'11", 220 (Anderson), both are extremely undersized for their roles at inside linebacker. They are also both very unexperienced, having spent the majority of their careers as special teams contributors while bigger names like Davis, Marshall and former starter Danny Trevathan gobbled up the defensive snaps. The presence of those lighter linebackers in the box (for comparison's sake, Marshall measures at 6'1", 250 and Davis at 6'1", 230) should also make running right at the Broncos a more palatable option. Previous editions of the Denver defense were too stout for the Patriots to even consider running at, but this year the otherwise terrifying Broncos D has a soft underbelly in the middle of the field, where they've clearly felt the offseason losses of 2015 standouts Malik Jackson and Danny Trevaithan. Only the Dolphins, Browns and Niners have allowed more rushing yards per game than Denver's 127.2. Some of that is due to volume, as teams have run frequently to avoid throwing at their secondary, but Denver's 4.2 yards per carry allowed is a far cry from the stingy 3.3 they surrendered last season. That statistic has predictably gotten worse since the injury bug hit Denver's linebackers: they allowed the inept running offense of the Jaguars to gash them for 154 yards two weeks ago, losing Marshall in the process. Last week, playing without Marshall, they allowed Tennessee's run heavy offense to roll for 180 yards on the ground. Running the ball effectively will benefit New England's offense in multiple ways. Most importantly, it will slow down the pass rush that has wrecked so many offenses over the past few seasons. We all saw first-hand in last year's AFC Championship game what Von Miller is capable of when able to completely eschew his run responsibilities in favor of pinning his ears back as a pass rusher. Falling into a predictably pass happy attack against these guys is practically suicide, particularly for whoever draws Miller as a responsibility. Being able to run consistently will also help the offense stay out of third and long situations, where Miller and co become even more dangerous. 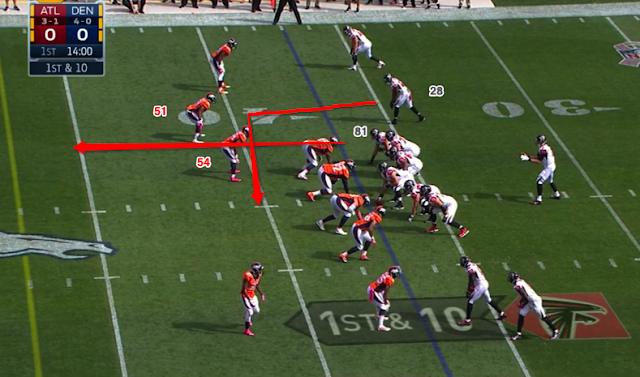 By the way, this was another aspect of the game plan that worked so well for the Falcons back in Week 5. Atlanta stayed committed to the running game throughout the afternoon, rushing 32 times for 122 yards. This commitment to the run forced the Broncos to stay in their base defense far more often than they wanted, which in turn helped Atlanta create those mismatches against linebackers in the passing game. It also helped to open up play action, which has been a key factor in Tom Brady's career season as a deep passer. 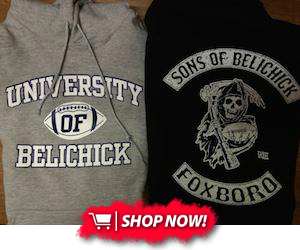 None of this is to say that we should expect the Pats to march up and down the field against this team. These Broncos are still one of, if not the toughest defenses in the league. They still boast the league's most dangerous combination of pass rush and coverage ability, and a roster littered with defensive playmakers. Miller is the headliner, of course, but Ware, Talib, Harris and TJ Ward are just a few of the other names capable of making a game changing play at any time. However, unlike previous years, this year's Broncos have some obvious weaknesses to attack, particularly now due to their injury situation. Before, the Broncos could force you into playing their game before proceeding to club you senseless with their defensive strengths. Now, the Patriots should have the ability to attack some of Denver's weaknesses, both on the ground and in certain man match-ups, forcing the Broncos to adjust to them rather than vice versa. It won't be easy (it never is against these guys), but the Patriots should have more than a fighting chance as long as they stick to the Atlanta script.